The Oriole electronic beeper is a sound emitting device wherein the sound is produced by the vibration of a metallic plate which is triggered by the expansion or contraction of a piezo ceramic element. - High-performance piezo-ceramic elements meet the loud sound volume and wide frequency range requirements. Our company has achieved widespread recognition in providing High Power Piezo Speaker. Introduces compact and powerful piezo tweeter, driver and horn with extended high frequency response, low distortion and excellent power handling capacity. These are ideal for use with existing Five Core range of 12 and 15 professional PA speakers. - Voice Coil : 1"
- Magnet : 10 Oz. Our reputed entity is engaged in supplying Piezo Speaker. 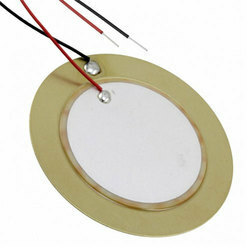 We are engaged in offering Piezo Speaker.